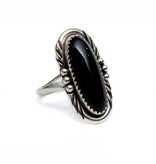 Home / Long Black Onyx Ring by Randy and Etta Endito (Navajo). Long Black Onyx Ring by Randy and Etta Endito (Navajo). Size 7 1/2. Sterling Silver and Onyx, handmade.